Taking a page from the early days of the hobby, 2016 Topps Marketside Pizza Baseball reminds us that collecting is not an isolated endeavor. Found exclusively in Marketside pizza boxes from Walmart, the simple release gives collectors a new angle for obtaining today's star players. Located within boxes of the retailer's house pizza brand, the actual card design opts for the basics with a large Marketside logo across from the Topps logo and a grid background design near the top. A more subtle grid comes into play at the bottom along with a text banner for the team and player name. 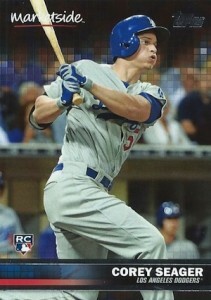 The back adds a few lines of text about the player and a card number. Given the very specific origin of these cards, 2016 Topps Marketside Pizza Baseball info trickled out slowly. 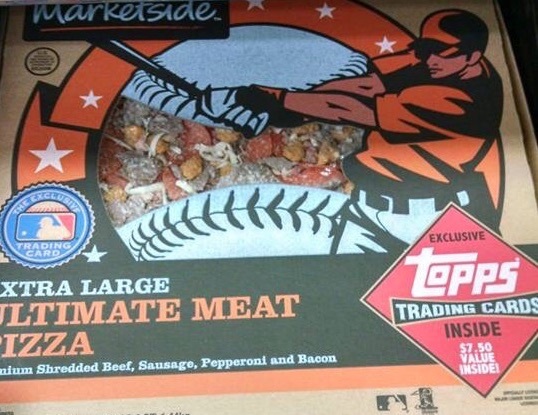 Those interested in tracking them down should be able to easily spot the pizzas included in the promotion as they feature a large red logo on the front of the box as well as a huge image of a batter in orange. An example box is shown below to help collectors identify the place to find these cards. They can also be found in select cheese bread and garlic cheese bread offerings from Marketside at a lower price point. Each Marketside box notes the "Exclusive Topps Trading Cards Inside" and the $7.50 value in additional coupons. Beyond the three base cards, there is also a code card for the Bunt digital trading game. With a full checklist of 50 cards and only three dropping in each pie, collectors will have to plan on consuming quite a few pizzas to make the set. The card promotion continues until the end of June. 2016 Topps Baseball - JOE MAUER, Walmart MARKETSIDE Insert Card #42, Twins! These cards are great! Already have 25 different cards. There are at least 47 cards in this set. We now 45 cards from this set along with many more doubles… There appears to be 50 cards in the set. These are really awesome looking cards, with excellent photography, and design. I look forward to going to Walmart once a week to buy several boxes of pizza, and bread sticks, as I try to complete this 50 card set. The Marketside pizza is pretty good as well. Cards are very nice. Pizza is great to. 50 card set means eating alot of pizza….which is ok too. We now have 34 cards of set…..hope to get them all before it ends in June. Picked up a Kyle Schwarber card on ebay for $3.80 shipping included. Very nice looking card, better than I’d imagined. Now l need to get to Wal-Mart and get some pizza’s and breadsticks so l can get more cards. These cards are definitely the best promo Topps cards ever put out. 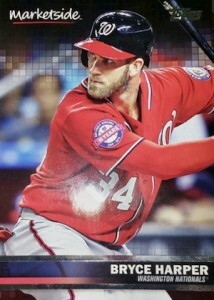 The only equal is the Topps New Era Lids promo cards. There is nothing odd – ball about these cards . The rear of the card isn’t loaded with stats. which is a nice break from traditional cards. Extremely nice quality.